Successfully Added TriZone - Unlocked QWERTY Cell Phone with Three SIM Card Slots (Worldwide Quadband GSM) to your Shopping Cart. 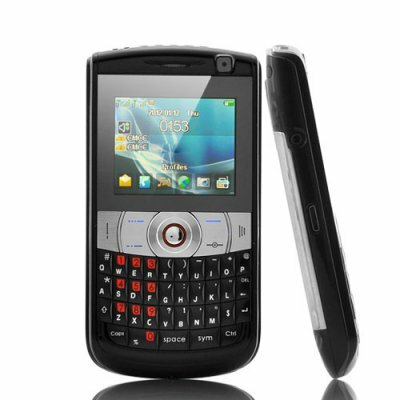 Enter the TriZone, a unique unlocked mobile phone with three SIM card slots and the added convenience of a QWERTY keyboard. Let the TriZone GSM Quadband Cell Phone keep your private number safe. With three SIM Card slots, this unlocked mobile phone is the ultimate business solution and an ideal device for high end connectivity in the world of communication. Use 3 different numbers for 3 different purposes. Never has there been such an efficient phone for such a great price. With its convenient QWERTY keyboard, the TriZone lets you enjoy everything with the ease of a truly enjoyable interface. The main advantage of a QWERTY keyboard is to make it easier for you to compose and send emails, SMS, and search queries. Even if many users are satisfied with the virtual keyboard of most phones these days, we recommended that a real keyboard is much more comfortable particularly for business users. For Work calls: On call and accessible with one SIM card dedicated entirely for work purposes to keep your work efficient. A dedicated work number also helps you maintain a professional image! For Personal Calls: Always reachable 24/7, you can have one SIM card just for your family and friends. For Travel Purposes: Make sure to keep an international pay-as-you-go SIM card ready and available. Making calls on your next trip can be easier and cheaper when you're prepared. produto de designer elegante e preço surpreendente.Com ceerteza otimo item para revenda.